Looking for the latest and greatest in eyelash extensions? Look no further! Novalash eyelash extensions give you a semi-permanent, longer, thicker and natural looking eyelashes. They look so natural that no one will know they are not yours! The application of eyelash extensions is a technical and meticulous process requiring highly trained estheticians to perform this extension technique. NovaLash Eyelash Extensions are individual, synthetic extensions singularly bonded to each natural lash to create a longer, thicker more lush lash look. NovaLash trained lash artists are instructed with the most comprehensive physician approved training course available. NovaLash training program is viewed as the best in the business and the results our clients have experienced over the last 7 years reflect that. With Novalash Eyelash Extensions your eyelashes will be softer, fuller, lighter and longer lasting eyelash extensions! Don’t have a lot of lashes to start with? Perfect! We can create the illusion of double or triple the lashes you have now and create the perfect set of lashes for you… at least 3 different lengths of lashes are used to give you a lush, full lash line that will look amazing for weeks. on techniques and products increase lash extension wear-time, longevity and speed in lash application. “I’ve been so lucky to work and train with some the lash and beauty industry’s most amazing and talented lash artists in the world, and I’m bringing their tips and techniques to Surface Medical Spas. I know that one of the reasons my clients’ experience superior results, is my passion for what I do… lashes are my whole world! I’ve received the highest level of training in the lash industry, by the leader in eyelash extensions, Novalash, and Sophia Novarro, and as of June 25, 2016 I’m certified with Novalash as one of their Advance American Volume Lash Artists and the only one in the state of Utah! As I continue to grow and learn, I want to continue to offer unmatched service and beautiful results that will improve my clients’ lash experience. Want a set of your own? 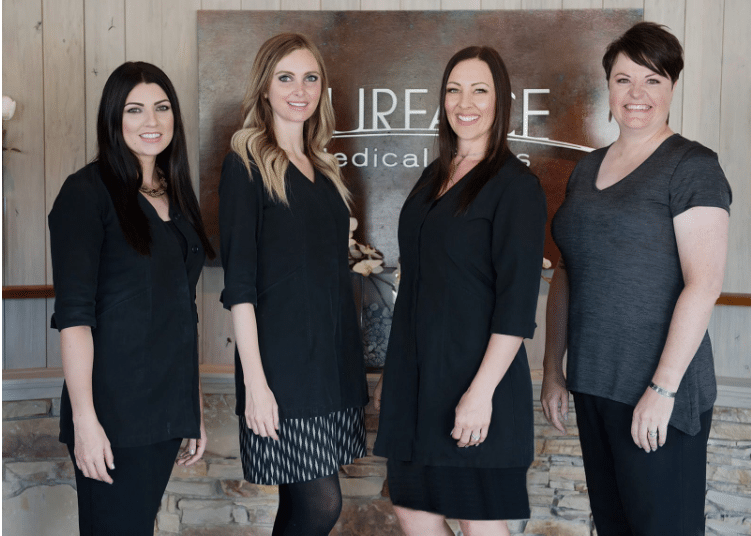 Just give us a call or schedule online, and make sure you mention “Eyelash Extensions” when you schedule; as the process takes a bit longer and specialists and scheduling is limited. Eyelash extensions are a synthetic lash that adheres to your natural lash to create longer, fuller and thicker lashes. These lashes will grow with your own lash until your natural lash sheds. We use a medical grade, semi-permanent adhesive that does not damage your lash or cause premature lash shedding. How long do eyelash extensions in Utah last? With proper after care lashes will adhere to the lash for it’s entire hair cycle, which is between 4-8 weeks. Natural lashes shed on a regular basis and when that happens the synthetic lash will shed with it. How often should I have my eyelash extensions filled? We recommend that lashes are filled every three or four weeks to maintain a full set. These appointments are usually between 30 minutes and an hour. Before your appointment make sure all makeup and creams have been cleansed from the skin. Your eyelash extensions will take between 45 minutes to 2 hours to apply. You will be lying down with your eyes closed, so it is the perfect time to take a quick nap!